UPDATE – 15 Apr 07: I’ve now had time to apply the registry tweak suggested by Intel to address this issue. For me, it works! I can now use my Maxtor drives in the system with zero iastor errors. Note that I have NOT tried to install Vista using the higher-numbered ports on the ICH8R controller, so I don’t know whether that part of the fix works. FLASH UPDATE – 2 Apr 07: Finally the vendor community has stopped pointing fingers at each other and recognised the problem – well, sort of. Special thanks to commentor Håkan Andersson for linking to this page on intel.com. In summary, Intel claims that Microsoft made changes to the Vista installation process that resulted in some disc power management features being activated for desktop PCs as well as for laptops. Desktop drives that don’t correctly implement the power management features then cause probles such as we have all experienced (and as are set out in the many fora linked below). this suggestion holds the most promise — perhaps it disables the unnecessary power management features. If you try out Intel’s suggestions, please post your results as a comment. Update – 19 Mar 07: after many hours of work I have uncovered strong evidence of a conflict between certain Maxtor hard drives and the Vista/ICH8R combination. The symptms of the conflict are listed below. I have COMPLETELY removed the problem from my system by replacing ALL Maxtor drives with other brands (I avoided Seagate as my supplier says that, since Seagate bought Maxtor, the Maxtor drives are just rebrands). I have received new firmware from Maxtor and will install it when I get a chance, to see whether it helps. For more details, see (especially) the first of the Asus threads listed below, and also the Microsoft TechNet thread. Intel, we have a problem! All around the web, PC users installing Microsoft’s new Windows Vista operating system are striking problems when they try to use hard drives in RAID (Redundant Array of Independent/Inexpensive Discs) arrays. Intel® 82801FBM I/O Controller Hub (ICH6M) – AHCI only. It’s quite possible that not all of these chipsets are effected. Problems appear to be evident for all types of RAID configuration (RAID 0, RAID 1, RAID 10, RAID 5) supported on these controllers. * It’s not possible to do a ‘clean install’ of Windows Vista. The installation often freezes with the Microsoft copyright notice on the screen, and with the green progress bar (sometimes known as the ‘Cylon Eye’) moving across the screen. * It’s not possible to complete a Vista upgrade from Windows XP. The first part of the upgrade process appears to go OK (‘hosted’ by Windows XP) but when the PC reboots to let Vista take over and complete the process, the system freezes with symptoms similar to the above. * Some users get repeated ‘STOP ERROR’ failures – often with error code Stop: 0x0000007b. * Some users have seen random data corruption and/or reboots (BSoD). In most cases, evidence seems to point to the Intel RAID drivers as the root cause of the problem. There is some evidence of conflicts and/or incompatibility between the Intel controller and certain Marvell Yukon LAN controllers – but this is not always the case. Motherboards manufactured by Asus and Gigabyte are impacted, as are those used by Dell in various systems. Other manufacturers’ products may also be hit. Many users have reported problems to Intel and/or their motherboard manufacturer. So far, Intel and Asus seem to be having difficulty reproducing the fault in lab conditions. The various players seem reluctant to acknowledge the existence of a widespread fault. There is no ‘silver bullet’ fix. Many workarounds have been suggested. Different workarounds work for different people. For some users, no workaround seems to provide a solution that allows the RAID array to function under Vista. Strong evidence suggests that the early Vista builds (Beta builds – prior to RC builds) worked OK, and that the problem has crept in recently. In almost every case, the systems worked fine under RAID when using Windows XP. This seems to suggest a software error rather than hardware problems. In almost every case, reconfiguring the Intel controller to work in IDE mode (this reconfiguration must be made in the motherboard’s BIOS settings) allows Vista to be installed and work fine. However, for most users this is only a short term workaround. There’s a reason to use RAID (speed increase under RAID 0, redundancy under RAID 1) – and it’s not possible to enjoy those RAID benefits in IDE mode. I’ve collected all the active discussions of this problem that I can find on the web. Please add a comment if you find another, and I’ll put it on the list. Microsoft TechNet: this is the motherlode, folks. A very long and detailed discussion of the problem, spanning Asus, Gigabyte and Dell products. Many workarounds discussed. Dell Forums: a discussion about the problem as manifested on Dell systems. Some evidence here that the problem is exacerbated when SATA optical drives are also connected to the Intel controller. Tom’s Hardware: a discussion of the problem appearing on Gigabyte GA-965P-DQ6 motherboards. Asus forums: a thread regarding the problem on P5B Deluxe Wifi-AP motherboards. Asus forums: as above, but for P5B Deluxe. Kapersky Labs forums: initially, these folks thought they had an antivirus problem – but they soon figured out it was Intel RAID! Microsoft Windows Vista Community: an online interaction with a real MS support person – pointing to bad drivers (on P5B Deluxe). Discussion on Lockergnome: possible workaround. Intel support form: fill in your details here and report the problem to Intel (again). If you find anything useful (links or resources) that I should add here, please leave a comment. Have tried to use any of the disks on the ICH controller in all modes (IDE, AHCI or RAID). No mather what I do the system is not stable when the disks are connected to the ICH. Generaly, the problems occured during prolonged intensive hdd workload, but in some situations they occured even when there was allmost no disk activity. I have noticed that just before the BSOD there is a sound comming from the HDD as if it has been turned off and back on. Has anyone else noticed such sounds comming from the hdd just before it freezes or BSOD? Since, I have managed to reproduce the errors in every mode of the ICH, I think that it is actualy related to hardware problem in the ICH or the firmware of the ICH. But, I recently upgraded from 2x1gb to 4x1gb and noticed that the problems are occuring more frequently. This makes me doubt that it might not be a h/w issue. I have connected 2x500GB to the jMicron controller and disabled everything possible relating to the ICH. Now the system is working in RAID, I have no timeouts (since the ICH is disabled), no hdd data corruption, I can install any OS I choose without any problem. 2) When testig the RAID array then there are there are several I/O errors. This might be the reason for the timeouts. Have you tried to disable the suspend to disk from Vista control panel? I have lost a lot of time with this problem and I am tired from the ICH crap. I don’t ever want to even try installing anything on the ICH (at least for the next 5-10 years). I have found some cheap pci-e sata raid controlers (~15euro) and if I ever need additional sata ports I might try some of them. After trying several things in last 3 days, this was the solution I did find. I did use Vista Setup Screen to quick format RAID 0 partitions. It allowed me sucessfully install vista and able to boot with zero problem..
My guess is something wrong with MBR if you do not use Vista Setup Screen. Somehow it can not boot from partitions which formatted by other tools. Could you pls tell me the registry tweak to fix this Intel RAID problem? I’d really appreciate some help here. I own an ASUS PW5 DH Motherboard with a ICH7R controller. For the last 12 months I have needed to rebuild my Vista RAID0 PC at least once every other month. I’ve backed up, so it’s not as stressful as it could be. However, for the last 2 months I’ve had to rebuild every month…For the last few weeks probably every other day and this is after a Vista SP1 install. the I have to rebuild / restore. I have two Samsung spinpoint 401 drives installed as a RAID0 set and have read all the stuff about the Intel Matrix Storage Manager problems. I have the latest BIOS and the latest windows updates as well as trying the drives on different Intel Ports. The machine has a ‘disk read error’ on startup, when I got home after a successful rebuild last night. I try to repair with the vista CD and am told that the boot sector is corrupt. I ignore this and don’t do anything. I turn the machine off for 30 minutes, turn it back on and it works perfectly! I’m seriously thinking that this might be a hardware issue now! I could do with some pointers from anyone. Could this be the error with the Intel drivers (of which I have the latest). I want to try to erradicate any possible driver errors before I start buying a new motherboards and/or new hard disk drives. Anyway, I’m happy my machine is up and running for ‘n’ number of hours / days! I had the exact same problem you descibe using WD Raptors in RAID 0 on my ASUS P5E. I was always able to install Vista (Ultimate/x64) only after several days I’d get the iastor.sys blue screen. Upgrading to the latest Matrix manager (7.8 1013), moving the RAID Array to SATA ports 2/3, and deleting the registry keys as described above seems to have stabilized my PC…so far. Definitely agree that this is related to power management, as I would consistently have the problem after the PC woke from S3 suspend…Your research was very helpful – Thank you. Maybe Intel is right. It is the combination of their chipset with the asus motherboard. I have another problem: The ICH9R on my ASUS P5E3 Deluxe works fine with Vista SP1, but I’m not able to install WindowsXP (SP1 or SP2, it doesn’t matter). In an early stage of the installation I get a BSOD. So it seems, Intel has fixed the problem with ICH9R for Vista, but you can’t use XP anymore. I have slightly different problem. I was able to build/install at least 3 systems using VISTA x64 and RAID combinations. Always RAID 0 + RAID 0 or 5. And recently Gigabyte x48 DQ6. There are huge issues installing Vista x64 on RAID. Always get the latest drivers in the first place that’s what helped me installing former systems. Unfortunately I do have a problem with completing installation with Gigabyte mobo. I tried to connect 4 HDD (RAID 5 infact) to ICH9 on MOBO (the drivers were propperly installed – i had no unrecognized hardware). Efect – the system doesn’t see the RAID because it has problem configuring the drivers for ICH9 but only if I plug the drives. The ICH9 driver doesn’t start because of mysterious error parameter unknown. Maybe anyone knows what it is all about. And… I know the solution. I only need to do new install of the system with all drives conected. (In fact I did it twice already with Comando and Maximus). Someone might think that I got problems because of lack of knowledge, but that’s not my case I live with RAID systems from the beginning and believe me there are even more problems now then 5 years ago. BUT F.CK we do have 21 century and we really do need sometimes to exchange data between systems, we sometimes do need that type ‘sophisticated’ functionality like attaching new drive to the system. We are living now in sad times, where clients do work for companies like testers, and receive only buggy hard and software. Is there any company on the IT world you coud count on? I doubt it. I used to think that you could rely on Intel, but surprisingly I had even more problems while using their mobo’s. These days companies struggle to put the products to the market ASAP which causes unbelievable number of errors. What could we do? Nothing? No you can always stop researching for them. Stop striving to find the solutions. You can always return the goods to the producers if they don’t meet your expactation. It’ is their task to cure the problem. It is all crap, believe me. So if you have working system don’t change it because you saw new chipset or technology came to the market – wait and get only reliable solutions, unless you want to be …. by them. (Use the word you like). Hope you’ll have better experiences. I am still troubled by this iaStor [Device/Ide/iaStor errors-event9] about once a month. Mine has the latest Intel ICH8R/ICH9R/SATA RAID Driver v7.8.0.1012. Can som one give me a solution to stop this iaStor recording in my Event Viewer? I have had *enormous* problems with Intel’s RAID too. I have a Dell Precision 370 with an Intel P4 3.2GHZ CPU, 925X Express Chipset (ICH6), 4GB RAM and 2 x WD Caviar 160GB SATA HDD’s. Was up until 4:00am last night trying to get Vista to install on a RAID0 stripe. Eventually got it to install, but wow, it was slow! Vista gave the machine’s HDD throughput at 2.2 in the perf results! Am horrified that Intel have done nothing to remedy this. RAID is all about perf and stability, no? Intel is delivering NEITHER! It’s not as if Vista is new or anything too – it’s been around publicly for over 2 years now. The ICH6 drivers are still at rev 7.0 despite Intel’s site suggesting that v7.5+ should be installed. They published new v8 drivers a couple of days ago, but the v8 drivers don’t support ICH6. C’mon Intel – time for you to support your products. Please fix your 7.x drivers too. I’m having something of the same issues. Hardware: DFI Lanparty UT P35-T2R, Q6600 (G0), 8GB Ram, 4x500GB disk on ICH9R RAID10. Multiboots to WinXP x86, Win2003 x86, Win2003 x64; but neither to Vista SP1 x64 nor Win2008 x64. Distribution boot hangs on the second screen (small green left-to-right progress bar keep repeating indefinitely). Even managed to get to a custom “Load Driver” option and tried the latest Intel Matrix x64 drivers (8.2.0.1001) with no better success. Intel’s own website at http://www.intel.com/support/chipsets/imsm/sb/cs-025783.htm talks about recently introduced issues with the now bundled drivers screwing up the LPM registry settings for the drivers. I think Microsoft needs to get it right first instead of making ME the “beta tester”. UPDATE: I came a lot closer to the real problem yesterday. If I disconnect the one SATA HDD that I have on the JMicron controller (JMB36X), the boot for Win2008 and Vista SP1 will both proceed. I don’t know if it takes both ICH9R RAID and JMicron SATA HDD to create this problem, but a “problem” it certainly is. At this point, I have a workaround, but it certainly is not satisfactory–I want to use HDD’s on the other controller too! *the operating system is either Windows Vista x64 with SP1 bundled in, or Windows Server 2008–their behavior in this regard is identical. Video: ATI HD 3450 PCIe with 512MB, with latest ATI Catalyst Drivers. 3. Use the “RAID+IDE” mode of the JMicron. drives are not actually runing in a RAIDset. update, and hope to have it ready soon. Was originally able to install Vista fine (using latest “F6” drivers for both ICH8R and Jmicron controllers) on the first of the two RAID sets. All Windows patches applied and was pleased to see incredible performance numbers for the RAID disks using HDTach. But as soon as you start intense filecopying or moving (either between disks or from the external drive), problems occur. I get timeout errors for “iastor” in the Event log, systems grinds to a halt and eventually BSOD with STOP error in iastor.sys. My problem seems to be very “heavy load” related as is many other peoples problem. etc. etc. to no avail. – Buy external RAID controller to put in one PCI slot. RESOLVED Vista and RAID on ICH8R problems! Finally!! !, moving one RAID set off the ICH8R controller to the Jmicron controller and moving disks off ports 0-2 on the ICH8R did the trick (so far anyway). I have no been running for about 24 hours with no timeouts, bluescreens or Error messages in the Event log under heavy disk load. 1 RAID0 (drive E:) consisting of 2x WD 750GB disks on ports 0 and 1 on the Jmicron controller. The Jmicron controller on this Gigabyte Motherboard (Gigabyte GA-965P-DQ6 Rev 3.3) is usually referred to as the GIGABYTE GBX336 RAID controller but is actually a Jmicron made controller. I installed the latest Jmicron windows driver (1.17.38.5) from the Jmicron site and it now shows up as “JMicron JMB36X Controller” in Windows device manager. For some reason HDTach now shows insane numbers for the WD Velociraptor RAID set, with Sequential Read Speeds peaking at 400 MB/s and burst speed of over 1000 MB/s. Must be software error. HDTach for the other WD 750GB RAID set show a more (but still good) believable Sequential Read Speeds peaking at 140 MB/s and burst speed of 430 MB/s. I have also overclocked again with stable results. The fix is apparently this: Upgrade to the latest version of Matrix Storage software from Intel. This fixes all the problems without the need to edit your registry, apparently. Tried all of these hacks on a Dell XPS One. Registry change, new BIOS, latest Matrix software. Nothing helps. It’s not even actually running RAID. 6. Now, you can install Vista as usual on the partition you installed XP (you can format the partition, no problem…) – no problemo ! I used to get stuck at the load screen (green bars) and get BSOD. No more! I am absolutely thrilled by this. I have no idea why I have to install Windows XP first. Here is how i got my two 300GB Velociraptors working in Raid0 on my ASUS P5E3 Premium wifi_AP @n (ICH9R). 1. Make sure you PC is disconnected form the internet. 5. Rebuild the raid0 array (CTRL+I). 6. Launch Vista instal from dvd. At the drive screen load the latest driver for the Intel® Matrix Storage Manager (current v7.0.0.1020). Delete any current partition (if there is any), then make new partion and format it. Press next to start installation. 7. First time you get to desktop enter registies. 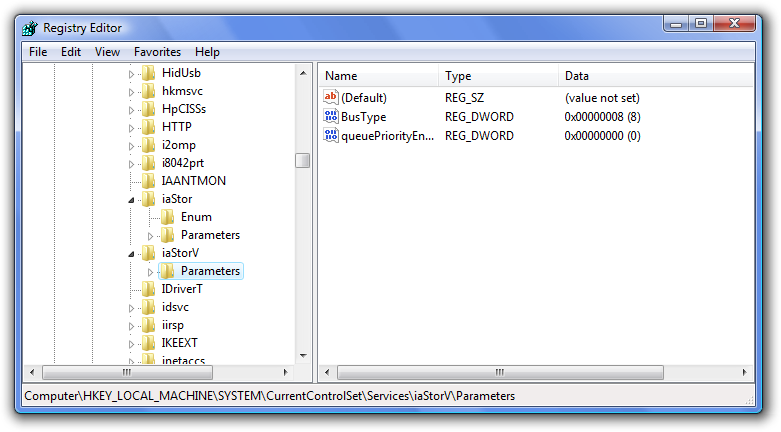 Delete both Parameter folders from the iaStor and iaStorV registry folders in the the Vista registry. 9. Install latest ICH9R drivers from Intel and other device drivers for your system. 10. Reboot. Connect your PC to the internet and run Vista Update for the first time. Are you still having this problem, or is it completely resolved? I’ve got a Asus P5Q deluxe ICH10r and 2 x Velociraptors. I’ve tried all of your fixes and my system still fails badly. BSOD’s and hangs. Most of the time the array is corrupt and won’t even boot anymore. This is a rediculous problem and I wish someone would release a firmware update or some kind of a real fix, instead of ignoring it. Shame on Intel and Western Digital. Perpetual rebuilds on my RAID-5 and not even a log entry as to why. I blame Intel for not logging when a rebuild restarts when it’s already in the rebuild state. It’s realy anyones guess why it does it, it at least could log it. Maybe it shows a notification.. but i’m not sitting behind my computer while it does it’s 40+ hour rebuild. I think Intel should be ashamed. I think Microsoft should be ashamed. Maybe someone in USA could start a class-action against intel as their Chip/RAID clearly does not function in Vista as advertized. Created a new array from withing VISTA using the matrix managent tool. Had it initialize completely, only took 8 hours or so. I’m scared to say it aloud, but it seems to be ok now. I’m just scared that *IF* a rebuild is ever required it will go in the infinite rebuilding loop as described above. Also, i think it is safe to conclude that -since the HW setup is identical- it is not a HW issue but a software issue. Only took me a week and several light stress related heart attacks. Best of luck to all who read this, and hopefully my post helps you or at least gives you some hope. Also, i think it is safe to conclude that since the HW setup is identical it is not a HW issue but a software issue. ^^^^^^^^^^^ My hardware IS identical!! In under 4 days two seperate clients each having dell vostro 400 computers with intel chipsets/ vista/ raid 1 mirror both failed to boot. Dell offers to replace the hard drive- all the drives pass all tests- they fail to see thats there is an issue comming down with the latest upgrades. To get the system to boot- break the mirror setting the second to not an array disk. Boot- raid software will ask to rebuild- NO- continue and system will boot. Dont know how to get drives bootable as a non-raid (PERMANANTLY) short of reinstall at this time- any ideas? This is my silver bullett: http://tw.giga-byte.com/Support/Motherboard/FAQ_Model.aspx?FAQID=2372. On my P5K PRO, the Marvell Yukon Pci express gigabit ethernet controller was the problem. I figured it out by starting a stress test (Bart’s stuff) on the ich9 raid 0 and then disabling the ethernet controller in device manager in vista. The system crashed every single time. Then i did the update from gigabyte’s site, it did some changes to the controller and voila. You know what, the problem emerged on my PC after half a year of usage after I accidentally install the Intel Matrix Storage Console, which comes with it new drivers. Originally when I got iastor timeout Event errors, I reinstalled Vista, using F6 method and deleting parameter registry before Vista finishes the setup by pressing shift+F10? near the end stages of the install. My PC had no problem ever since. Now I don’t get Windows event errors at all, yet HDD LED light stays on for half a min up to a min in some cases, extremely slow disk access during so, and unpredictable occurrence rate. 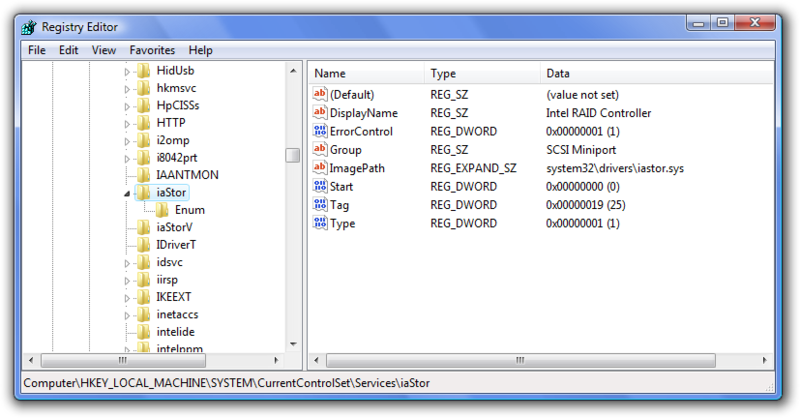 I have deleted registry, reinstalled Intel Storage Matrix driver, Jmicron driver, etc. Marvell ROM code is rev 14 updated. I am using Asus P5K-E, couple of RAID0 and normal drives and a full usage of the SATA ports. Had this issue with my P5B deluxe for 2 years (since I switched from xp to vista actually) : computer working fine but random lockups (vista completely frozen, I had to power off/on the computer). Last week I updated the intel matrix storage manager with the latest version from the intel web site and now everything is working fine, the freezes are gone !! Shame on you Asus, the beta version you are offering on your web site is crappy. I am running an amd phenom 9600 on an a770m-a elite group board. My sata raid is not working period. It’s not even reading my dvd rom drive. I read your article with interest but it appears that my Windows Vista basic would be the problem. I have spent hours trying to find a solution on the web with no joy. Can you help me? On any motherboard using the onboard Marvell Yukon 88E8056 will have stability problems unless it is updated to REV 14 (Marvell PXE 6.60.2.3). Your post was helpful in resolving my issue. Here’s the summary… Hope it helps someone out. My buddy has a Dell XPS410/Dimension 9200 with Vista 32-bit which was giving a variety of problems, including startup errors and general instability, as Vista has a tendency to do. I tried several fixes, including an in-place upgrade of Vista and a clean install on the existing Vista partition (you know, the one where the existing Windows folder & profile are moved to Windows.old). In both scenarios, the installation stalled out after the reboot around the 67% mark, during Completing Installation. The system hung, the pointer wouldn’t move, fans shut down and the HDD stopped spinning. A quick scan of the internet revealed that this is a known issue with this particular motherboard/chipset/onboard RAID controller. I tried a variety of install strategies, all including the Load Drivers option early in the install process. I also tried installing Windows 7 and that hung at the same place, so the problem was not a Vista issue. The problem seemed to be with the drivers for the RAID controller. 3. Connected the HDD to SATA port 3 on the controller hub and the DVD to port 4 (suggested on Intel’s site: http://www.intel.com/support/chipsets/imsm/sb/CS-025783.htm) . 9. Also, change boot sequence to actual HDD (in my case, Maxtor) – you may have to save/exit BIOS setup, let the reboot start and enter BIOS a second time to make the actual hard drive show up in the boot sequence.